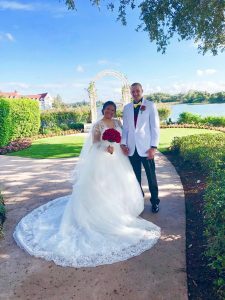 What a magical wedding for Zachery and Ashley in the Wedding Pavilion at Walt Disney World Resort, in Orlando, Florida. The groom walked over from his stay at the Grand Floridian, dressed in black slacks and shirt, a white jacket, and a bright yellow bow tie, he looked dapper to say the least. Ashley wore a floor length lace wedding dress and carried a beautiful red rose bouquet, made by the Disney Florist. With hidden Mickeys all over the bouquet and boutonniere everything fit their theme of classic Disney. Hannah with Disney Fairytale Weddings coordinated the event. Bill played classic Disney songs on the organ while Lori-Jean accompanied on the violin. Darin with Disney Fine Art Photography captured every moment from the arrival of the bride to the first kiss; their walk down the aisle as husband and wife to the exit from the Pavilion over the bridge. Seven years ago, before I met you, I felt like my life was full and enriched. You magically walked into my life and made me realize I never actually knew that true love existed. You bring out the best in me and always have a positive upbeat attitude, except when I wake you up in the morning on your days off. I have no doubt that life will hold many surprises for us to take on together and I look forward to what the future holds for us. We make an incredible team and I am beyond thankful for everything you do. You make each passing day something to be excited about and if there’s one thing I am sure of it is that you make me strive to be a better person. I love you more than life itself and that will never change. Love-a four letter word used to express the way you feel about someone. I assumed love for me was impossible until I met you. Through love you showed me that anything is possible and dreams really do come true. We have had our ups and downs, but through those up and downs we have become stronger together and fallen deeper in love with each other every day that passes. With this next journey in life called marriage, I can’t wait to see where love takes us and how much we will grow together. I love you to the moon and back baby. Congratulations Ashley and Zach! We wish you a lifetime of happiness.